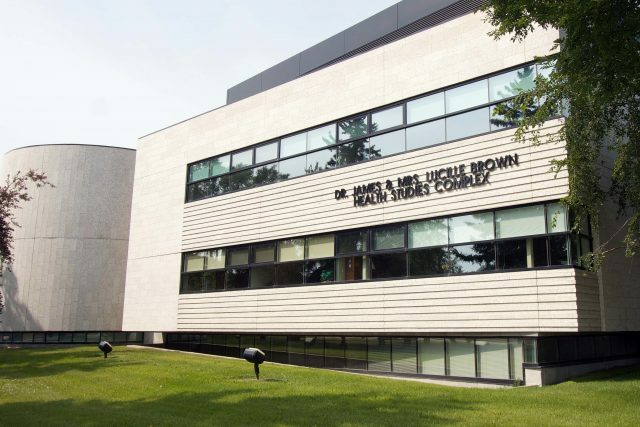 The Dr. James and Mrs. Lucille Brown Health Studies Complex will be the site of two talks as part of the Medical Humanities Symposium at Brandon University. BRANDON – Public talks by a pair of internationally renowned academics will be among the highlights of the Medical Humanities Symposium, taking place this week at Brandon University (BU). Dealing with the connection between the arts and medicine, the symposium will be held on Thursday, Sept. 20 and Friday, Sept. 21. On Thursday, Dr. Daniel Laforest, of the University of Alberta, will present Synesthesia and Holism: The Importance of Literature in Medical Humanities on Thursday. The lecture will take place from 5 p.m. to 7 p.m. in Room 141 of the Dr. James & Mrs. Lucille Brown Health Studies Complex. On Friday at the same location, Dr. Lucille Toth will present “I Was Diagnosed With …” A Performative Conference on the Challenges of the “I” in the Medical Humanities. The talk will take place from 3 p.m. to 5 p.m.
Dr. Jonathan Allan and Dr. Ariane Hanemaayer joined Mihelakis in developing the symposium, and they hope that the event becomes a catalyst for greater study of the medical humanities at BU. While the organizers all teach in the Gender & Women’s Studies program at BU, they have varying academic backgrounds and research activities. Hanemaayer also teaches in the Department of Sociology, while Mihelakis teaches in the Department of Classical and Foreign Languages. Allan is the Canada Research Chair in Queer Theory and teaches in the Department of English and Creative Writing. “This symposium includes the participation of the faculty and staff from the Faculty of Arts, the Faculty of Education and the Library,” Allan said. “I think this is a real strength of the project. Dr. Demetres Tryphonopoulos, the Dean of Arts at BU, seconds the symposium organizers’ enthusiasm for the future of medical humanities research. Laforest is an Associate Professor of French and Cultural Studies at the University of Alberta. He has been a Visiting Professor at the Stanford University Center for Biomedical Ethics and was the recipient of the Jean-Éthier Blais Prize in 2011 for his work L’archipel de Caïn: Pierre Perrault et l’écriture du territoire. His talk will look at the struggle between nostalgia and aging. Toth’s presentation will advocate the use of the first-person perspective in medical humanities work. Toth is an Assistant Professor in French and Italian at the Ohio State University and the founder of the dance project On Board(hers), which explores gender and global mobility.